According to media reports, a severe blast ripped through a police headquarters on Monday in the second biggest city of Indonesia Surabaya. The attack was carried out by suspects driving "vehicles", AFP cited East Java Police spokesman Frans Barung Mangera. At least seven police officers were killed, local media reported. According to Frans Barung Mangera, the explosion had occurred at 8:50 am local time (01:50 GMT) at the main police office. Members of one family conducted an attack on Police HQ in Indonesian city of Surabaya, according to police. — Richard Allen (@iA7med08) 14 мая 2018 г. 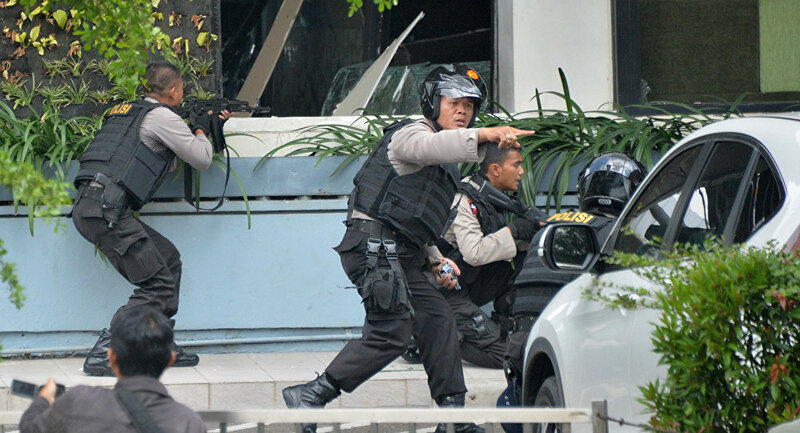 According to the CCTV footage from the scene, the assailants arrived on the motorbikes to the police HQ's security checkpoint before detonating an explosive devise, the Jakarta Globe newspaper reported. — #JatimMakmur (@Surabaya_Makmur) 14 мая 2018 г. "We can't be open up all details yet because we are still identifying victims at the scene and the crime scene is being handled," East Java Police spokesman was quoted as saying by Reuters. Meanwhile, the police have already found the links with the Sunday attacks on churches in Surabaya. “Similar types of explosives were used,” Frans Barung Mangera said. “Our personnel are identifying the victims. So far, we have accounted for seven victims. We are still collecting data,” East Java Police spokesman told reporters. Indonesian President Joko Widodo has reportedly vowed to push through a new anti-terrorism legislation to combat raging networks of Islamist militants in the country. Moreover, Widodo has claimed the Sunday's bombing attacks on three churches in Surabaya as well as a recent one outside police office as "the act of cowards, indignified and barbaric," Indonesian President was quoted as saying by Reuters. On Sunday, alleged Daesh-linked family of suicide bombers, including two young daughters, staged deadly attacks at three churches in Surabaya during Sunday services. At least 14 have reportedly died as a result of the attack with more than 40 injured, local media reported. — Tweet Militer (@tweetmiliter) 14 мая 2018 г. The recent deadly incident at the local Police HQ is a fourth explosion that took place in Surabaya over the last days and the fifth one in the eastern part of Java island. Also on Sunday, another explosion occurred at the apartment building in the town of Sidoarjo, which borders Surabaya, according to the Jakarta Post newspaper. The blast was presumably caused by an accidental detonation of the explosive device. Three people were killed in the incident.